In 1993 the London pop group East 17 released their single It’s Alright, heralding a new era for boy bands and making E17 the most exciting postcode in popular culture. In 2019 this song provides the inspiration for the fourth Art Night festival in Walthamstow and King’s Cross. The 12 Art Night curated projects have been conceived in response to the physical context of these locations and the communities who use them. The festival will explore the distinct identity, culture and architecture of Waltham Forest, highlighting the area’s expansive market culture through a series of new commissions along and around Walthamstow High Street — Europe’s longest outdoor market — and other local landmarks. 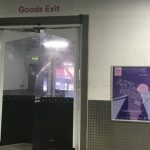 Additional activations will take place in King’s Cross — London’s dynamic transport and culture hub, only 14 minutes on the tube from Walthamstow — encouraging audiences to enter the Art Night trail via the 24- hour Night Tube on the Victoria Line. Each artist has been invited to consider ideas around Hope, Love and The Future and how communities might care for and support one other amidst a time of political and cultural uncertainty. Art Night 2019 will occupy familiar places where people are brought together in everyday life — the market, cinema, pub, community centre, library, shopping mall, museum, car park, school, places of worship and the street. 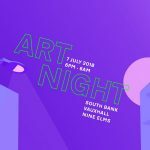 Over a dozen iconic and unique public sites such as Walthamstow Town Square, Walthamstow Library and The Mall in Walthamstow and Coal Drops Yard and Cubitt Square in King’s Cross will feature in the Art Night Curated programme. From cultural landmarks William Morris Gallery and the kilometre-long Walthamstow Market, to the more unusual Walthamstow car park and listed 1930s former cinema Mirth Marvel & Maud, Art Night 2019 will continue to unlock London’s extraordinary public and private spaces to transform them for one night only. 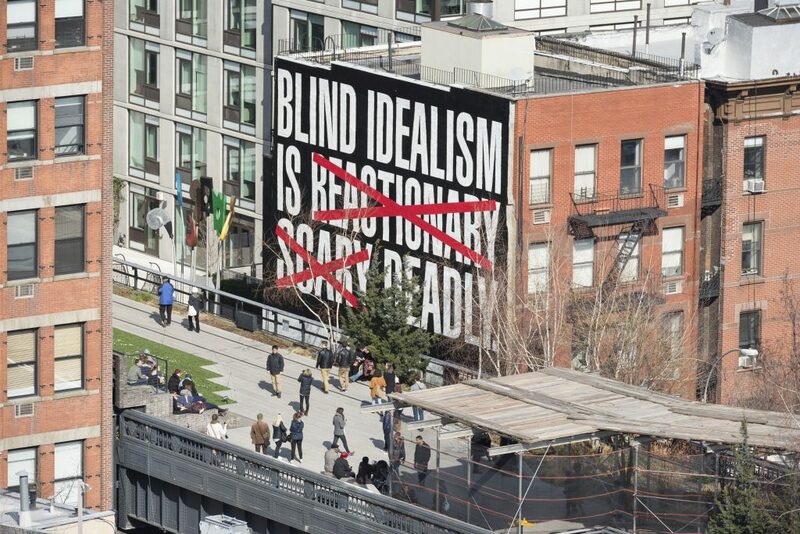 The Curated Programme will comprise of new commissions by internationally renowned artists including Barbara Kruger, who will be presenting her first large- scale outdoor commission in 15 years in the UK, in Walthamstow’s Town Square — questioning consumerism, individual autonomy, desire and power. Christine Sun Kim will transform Coal Drops Yard in King’s Cross with a three-part commission, collaborating with students at the local Frank Barnes School for Deaf Children to create two works — an experimental new multi-channel video installation and a text- based ‘declaration’ in Cubitt Square, as well as a durational sound piece at the new arts-focused COS space in Coal Drops Yard, exploring how experiences of deafness shape understandings of language and culture. Artist duo Hannah Quinlan & Rosie Hastings will present a ‘musical spectacle’ travelling through Walthamstow Market, which brings together musical genres — including disco, House, High NRG and Pop — into a single dramatic vision performed and centred around a Pride float. Oscar Murillo will be working in close collaboration with people in Walthamstow before, during and after the festival to create a new commission titled Welcome to the members’ club. Alice Theobald will present a new site-specific video installation and live music performance staged in The Mall, Walthamstow. 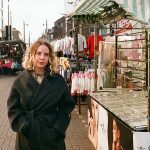 Made in collaboration with a local acting coach and shooting on location in Walthamstow shops, Theobald’s 2-channel video installation will explore aspects of the performance of everyday life and the concept of buyer’s remorse, referencing popular TV makeover shows such as Queer Eye, What Not To Wear and Streetmate. Working in collaboration, artist Cory Arcangel and organist Hampus Lindwall have invited a group of artists and musicians to compose new music to be performed on the organ of St Mary’s Church Walthamstow. The commissioned artists include: Ellen Arkbro, Pierre Bismuth, Kara-Lis Coverdale, Hanne Lippard, Haroon Mizra, Charlemagne Palestine, as well as world premieres by the commissionaires. Artist and composer Joe Namy will plug into London’s custom-designed car stereo subculture, presenting a sound installation using local car owners’ vehicles and their sound systems in a Walthamstow car park. Award-winning dancer and choreographer Julie Cunningham will present a new performance, continuing their research into the queer body, at a school in Walthamstow. 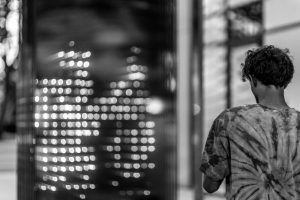 The historic reading room of Walthamstow Library will host a multimedia theatrical installation by Zadie Xa, inviting audiences to enter into an immersive, subaquatic and marine environment of spoken word, with impromptu performances by dancers and musicians throughout the night. This project is a co-commission with YARAT and Tramway, Glasgow. Frances Stark’s The Magic Flute — a collaborative interpretation of Mozart’s famous opera with conductor Danko Drusko, performed and recorded with a group of young musicians (aged between 10–19 years old) from Los Angeles – will be screened at 1930s listed cinema Mirth, Marvel & Maud. Exploring real and fictional figures from Mauritian, Madagascan, and British colonial histories, Shiraz Bayjoo will work in collaboration with young people from Mission Grove Primary School in Walthamstow. The commission will draw upon Bayjoo’s research and practice on European legacies throughout the Indian ocean region, and consider the UN’s convention on children’s rights, set against a dystopian landscape of failed states and ecology. This project is a co- commission with Iniva. Emma Talbot will present a series of paintings on silk installed at William Morris Gallery and other Walthamstow locations, responding to the work of Madge Gill — a self-taught artist, medium and spiritualist who was born in Walthamstow in 1882 — whose solo exhibition will open at William Morris Gallery on the same night. Running alongside Art Night’s Curated Programme will be special projects and events selected as part of Art Night Open, directed by Zarina Rossheart, which offers cultural organisations, as well as independent artists and curators, the opportunity to take part in the festival and respond to the 2019 themes and cultural trail. Details of these projects will be announced in the coming months. Art Night is London’s largest free contemporary art festival, transforming the city annually for one unforgettable night. Each year, Art Night invites a leading cultural institution or curator to explore the history, culture and architecture of a different part of London, inspiring a series of new commissions, one off events and premieres by international and local artists from all stages of their careers. Alongside this, the Art Night Open programme offers local organisations, independent artists and curators the opportunity to take part in the festival — responding to the curatorial ideas and cultural trail. Art Night contributes to the UK’s art sector through its Legacy programme, which delivers co-commissions, acquisitions for public collections and prolonged display periods — enabling broader audiences to enjoy the programme, year-round. The festival was conceived and founded by Ksenia Zemtsova and Philippine Nguyen. This entry was posted in NEWS and tagged Art Night, Art Night 2019. Bookmark the permalink.